This appears to be an early spoof on photography in which the same person is both sitter and photographer in this manipulated image. I came across a gem of a video the other day and thought I’d share it with you. But to digress a bit, its title brought back some great memories of Don Novello, a comedian whose character, Father Guido Sarducci, made millions of viewers laugh in the late 70s and early 80s when he appeared on Saturday Night Live and many late-night talk shows. Sarducci explained: “The idea is that in five minutes you learn what the average college graduate remembers five years after he or she is out of school. That said, you can see how the title of Matt Rycroft’s “The History of Photography in 5 Minutes” made me flash back to Father Sarducci and I thought: “This has to be a joke. How can you cover 190 years of photographic history from the time of Niepce’s first photo in 1826 to the present in five minutes? As it turned out, though, it’s a lively, well-written and directed animated film short that hits all the high points. 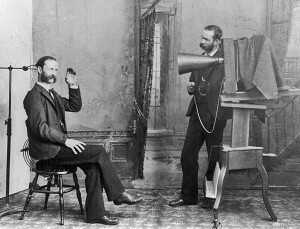 I even learned something I hadn’t known: that aside from posing stands used to keep subjects from moving during three-minute-and-longer exposures in Victorian studios, Rycroft says that photographers also offered drugs to their clients, presumably to calm their jitters. Videos of Don Novello’s “Father Sarducci” comic routines. Text of the “Five Minute University” classic. “The History of Photography in 5 Minutes” © Matthew Rycroft at cooph.com. Used with permission. This Red River Paper blog is really good and has enriched my knowledge every time I read it. Nice post, Thank You for taking the time to share all that. Thank you for the film! I have been a grateful customer of Red River Paper for many years.